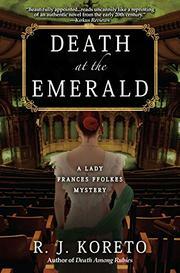 A noblewoman and sometime sleuth helps a distraught mother learn the truth about her beloved daughter, who vanished back in 1875. When elderly Lady Beatrice Torrence learns about “the practically notorious” Lady Frances Ffolkes, she sends the emancipated private detective (Death Among Rubies, 2016, etc.) a note and later implores Frances’ help in learning the fate of her daughter, Louisa, a rising theatrical actress who disappeared without a trace 30 years ago. Genuinely intrigued, albeit surprised, by the offer, Frances sets to work almost immediately. She starts with the Green Players, the company Louisa was working with at the time of her death. Coincidentally, they are about to produce the same play, Romeo and Juliet, that was in rehearsal when Louisa disappeared. Shortly after Frances questions the Players’ stage manager, Mr. Mattins, he’s stabbed to death in the street. In response to further inquiries, Frances learns that Louisa had changed her name to Helen and, according to chatty Rev. Halliday, was widowed when her husband was fatally stabbed during a robbery. The killer was never found. Frances, certain that the death of Louisa/Helen's husband is no coincidence, soon finds that her conviction is leading her along a perilous path. Frances and her faithful maid, Mallow, find Helen’s grave marked with a puzzling epitaph: “God Has Heard.” She recommends an exhumation to Lady Torrence, who complies. The result profoundly changes the complexion of the investigation yet again. Koreto’s third period mystery, beautifully appointed and written with measured authority, reads uncannily like a reprinting of an authentic novel from the early 20th century.